The Courtyard Dayton Beavercreek is located within a mile from the Wright-Patterson Air Force Base, Wright State University, and the Nutter Center. We are conveniently located minutes from downtown Dayton and University of Dayton. Steps away from the Fairfield Commons Mall. With our refined, contemporary decor, a well-appointed fitness center, and indoor pool. 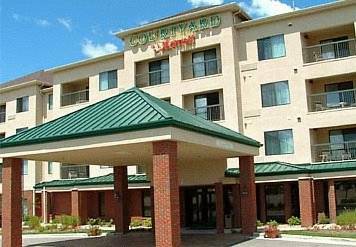 Your stay at Courtyard Beavercreek Dayton is sure to be more comfortable, more productive and more enjoyable than ever before. This Dayton area hotel's inviting lobby,features flexible space to work or relax, free Wi-Fi throughout and easy access to the latest news, weather and airport conditions via our GoBoard. Experience The Bistro - Eat. Drink. Connect which provides guests with healthy food and beverage offerings in the morning and evening dinner service with cocktails and Starbuck's beverages. We are just minutes from Central State University and Cedarville College, and the U.S. Air Force Museum.